In this implementation of a date range app, we bind our dateRange model properties (startDate, endDate) to two input fields (from,to). The idea is that based on the start date selection, we define the constraints for our end date. In this example, our constraints are set to a future date and no more than seven days. 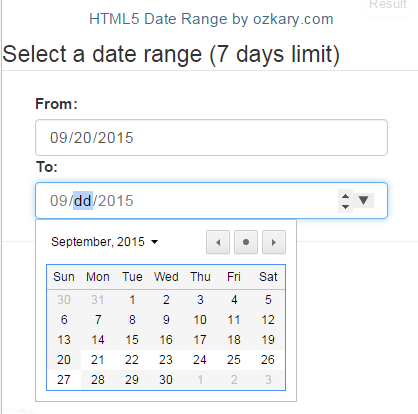 To enable the native date picker control, we set both input fields to “type=date”. This enables the device to render a native control for the date selection as well as the limit on what can be typed in the control. As we change the start date, the on-change event is raised. In the handler for this event, we set the min and max HTML5 properties which help us on set the edge input constraints for the end date field. In our case, we set the min to one day more than the start date and max to seven days more. This is done by binding the model properties (minDate,maxDate) to the input field properties (min,max) respectively. We should also note that we must use the ISO date format (yyyy-MM-dd) otherwise our constraints would not be enforced. The result of settings these edge constraints are reflected on the date picker as only the dates with-in the constraints are enabled. All other dates are disabled (grayed-out) and can’t be selected. As devices adapt the HTML5 standards, our apps can leverage their native support which enables our apps with a much better user experience. 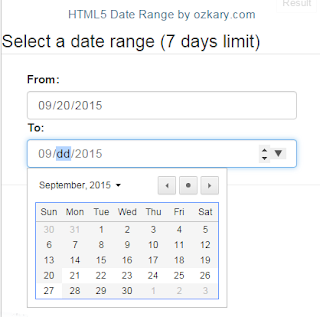 Awesome article on AngularJS HTML5 Date Range Controller. The beauty is it works in all devices.